Blood cells, artwork. 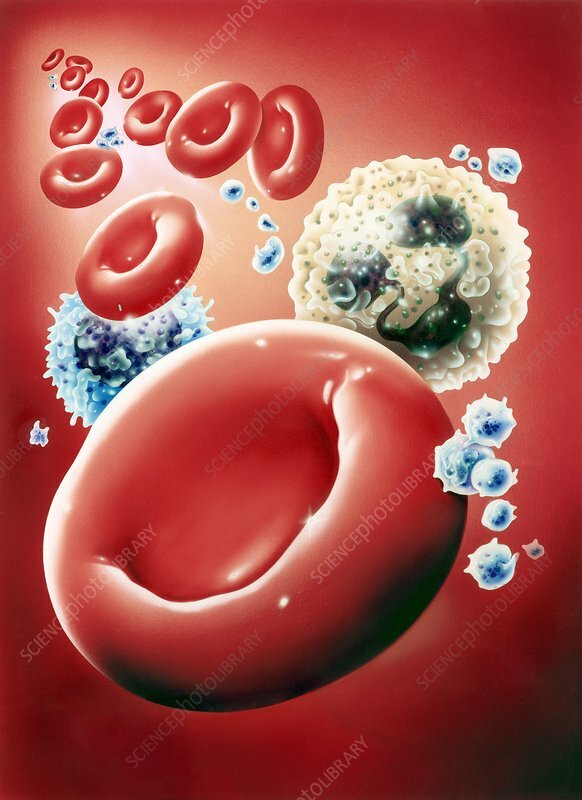 Red blood cells (erythrocytes, red) distribute oxygen to body tissues, and carry waste carbon dioxide back to the lungs. White blood cells (leucocytes, blue-white and yellow-green) are part of the immune system. They attack and destroy infectious agents (pathogens) and foreign substances, and destroy and remove cellular debris. Platelets (not shown) are active in blood coagulation (clotting). Types of white blood cell are neutrophil, eosinophil, basophil, lymphocyte and monocyte. They vary in appearance, from multi-lobed nuclei to the presence or absence of granules.